Sometime Monday night, Pyrofer’s Projects’ Rockfall [App Store] appeared in the App Store and described itself as a “classic rocks and gems game". 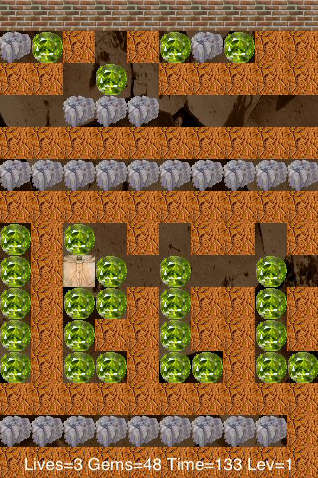 Guide your player around the underground maze to college the Emeralds without being crushed by falling rocks. Avoid other creatures that dwell in the underground and work out how to use them in your quest for the exist. Each creature reacts differently but most will kill you if they get the chance, and can you crush them with a rock first? 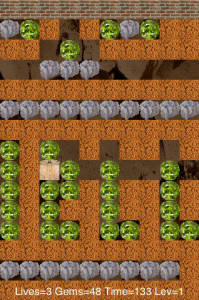 8-bit gamers may recognize that description of the gameplay of popular 80’s game, Boulder Dash. Through the magic of Java, readers can play a reasonable clone online. The basic gameplay of Boulder Dash requires the hero to dig through caves to collect gems. Digging simply involves moving your character in any direction. The tricky part is that gravity remains in effect. If you dig under an object (a boulder, for example) that object can fall down and crush you. Your goal is to collect enough gems (which can also crush you) while avoiding boulders and other obstacles. Once you collect enough gems, a doorway will open to the next level. Boulder Dash and its collection of clones carry with it very specific world rules which make the game incredibly fun. Each level is a puzzle in itself. You can, for example, stand immediately under an object and it won’t crush you. However, if you move down one space, it will then fall and crush you. Pyrofer’s Projects’ $4.99 version, however, feels unfinished. The game has no sound effects, your main character is curiously represented by a picture of Leonardo da Vinci’s Vitruvian Man, and the controls are sub-par. In the original version, quick joystick control was required to navigate some of the more complicated mazes. The iPhone controls that have been chosen seem unable to accomplish those tasks. As we’ve seen, swipe recognition can be an issue in games, but in this instance, the complexity of the “swipe then swipe back and turn" causes particular frustration while playing this game. After some experimentation, a quick swipe-hold, lift up, swipe-hold in new direction seems to work but is still not ideal. There are also common situations during the game where you may accidentally wall yourself in. In these cases, you need to restart the level, but without any way to accomplish this in the iPhone version, you either have to wait the timer out, or quit and restart the application. While many of these issues may get corrected in future versions of the game, I’d recommend waiting until then before buying.